On the common frequencies used for ATV (146 MHz above) the antennae changeover relay is a critical component and must be low loss so not to adversely affect both transmit and receive performance. A good paper to read is Ian White's DG8 pre-amp article - http://www.ifwtech.co.uk/g3sek/vhfdx/dg8-preamp-v7.pdf - it's designed around 145 MHz but covers a lot of good practical engineering practice for pre-amps etc and does talk a little bit about the need for good relays. For 70 cm you can use reasonably cheap BNC relays and the Cx540 N type relay which are often available surplus. On the input you can use something like the RS951 relay and you can pick them up at rallys for a couple of quid! For the microwave bands (1.3Ghz and above) you need microwave relays. These come in many types but the most common are TNC, N or SMA. Good N-type relays (not the CX520s) tend to be expensive. SMA relays are much more common for about £10 and up at a rally or microwave round table. It helps to know what you are looking for, RLC, Radiall, Teledyne etc. Whilst 12v operation is desirable, most surplus relays are 28v operation. This can easily be overcome by using a switching regulator from ebay as shown in the picture (search for step up buck regulator) to boost the 12volts on transmit to 24v. Some relays require driving in to both positions - this can easily be achieved by using another DC changeover relay which is driven by the PTT line and switches the c/o relay DC supply to appropriate contacts. The PIC controlled sequencer at shortwaveradio.co.uk called TROPIC may well be a good choice. The kit is listed at £11.50. A lot of surplus microwave relays are transfer relays - these can easily be recognised by having 4 connectors or ports. 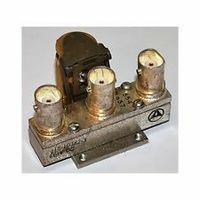 These are entirely suitable for use as 3 port change over relays and can actually be used to provide additional protection to your pre-amp by putting it in to a 50 ohm load on transmit. This page was last modified on 6 December 2018, at 16:44.